Discussion in 'Lighting and Electrics' started by thatactorguy, Oct 29, 2018. Don't let Clancy see this, they'll post it on Facebook . I wonder if you could run some unistrut down the length of that 2x4. Thinking out loud, of course. Do you think the strut woild be less expensive than simply installing pipes. Would seem close. At the bottom of the attached page is a B-Line combo nut and washer. The picture doesn't show it well, but there is a spring that connects them together. We provide these whenever we install a Unistrut lighting grid. They solve the problem of the nut twisting off of the locking rails inside the channel and eventually dropping the light. They also solve the problem of the yoke sinking into the channel slot as you rotate the light. They also keep the nut in place while you thread in the bolt. Just a suggestion when you use Unistrut for hanging lights. Unfortunately, I have seen lighting hanging on 2 x 4 hundreds of times. I always point it out in our inspections with emphatic verbiage telling the users to change their evil ways. The clamp is designed for 1.9" OD round tube (1 1/2" Sched 40 steel pipe). It is not designed for squared corners or soft wood. The clamp damages the wood and weakens it. Usually the wood is not secured to the ceiling/structure, etc. And then there is the whole hot light and combustible product issue. Proximity to said hot light can dry the combustible product making it easier to combust. This heat problem is made worse when you "properly drill and bolt the light to the 2 x 4" as you lose 4" of distance from the lamp to the wood. One should use the tools properly. Use pipe, properly supported and secured. Or use Unistrut, properly supported and secured with the combo nut. Forget the wood structure. dvsDave and RonHebbard like this. Looking at the positive aspects to that photo, you don’t need to worry about the c-clamp getting over-tightened and failing ! Thanks for that reference, never seen those before. Very cool! Seems like they would make hanging lights way easier than traditional spring nuts. Also, on the few occasions where I've used a C-clamp on 2x4 (or other non-pipe structures such as steel beam flanges) I have cut a sacrificial piece of 3/4" plywood about 4" square and put that between the clamp bolt and the structure. I also drill a hole in the corner of the plywood and safety it off with a piece of tie line so it can't go falling down on anyone's head when the fixture is taken down. I can't say that I have ever hung a fixture sideways using this method though, seems like that would put a lot more stress on the clamp. In a normal yoke-down hang the bolt is at least mostly just snugging the clamp to the structure and not resisting a significant torque as well. Good thought. I would still stay away from wood as much as possible. With steel beam flanges, there are clamps meant for attaching loads. And they have published safe working loads. Call or email me, I can direct you in what to buy or sell them to you. One other thought to give you. When I said properly supported and secured, I meant solidly mounted as though permanent with the proper hardware for the work. A solidly mounted light is easier to focus and is less prone to slip out of focus. Good thought. I would still stay away from wood as much as possible. I definitely stay away from it as much as possible, as should anyone else. 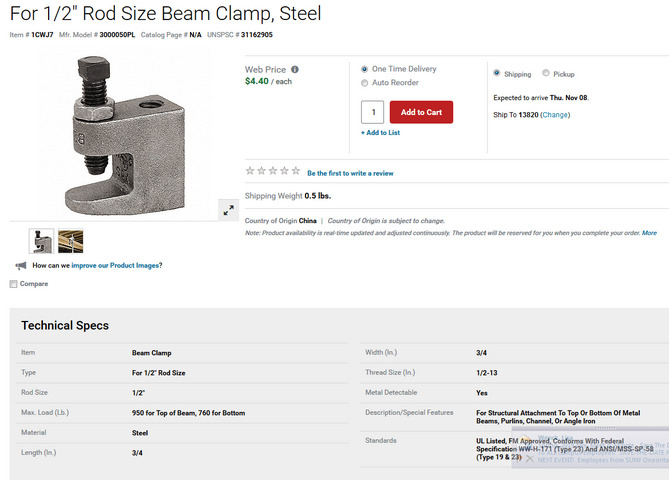 When working with steel if there are beam clamps available that is definitely the first choice. A style of clamp I've seen in use on fixtures are like these intended for use with threaded rod... is there something else that is more appropriate? Yup. A great clamp. Cup point, so it cuts into the metal and can't slip off without loosening the set screw. Good SWL. We use hundreds of them. Keep in mind that the SWL is based on a 4 to 1 factor. If you are trying to stay within the 5 to 1 factor that is used by the industry you will need to multiply their SWL by 4 and divide that sum by 5 for your SWL. When we use this clamp for stage lights, we do not attach the fixture directly to the clamp. We use a 3" x 1/2" threaded rod locked into the clamp with a jam nut. We then put a nut about an inch from the other end of the rod, put the rod thru the hole in the yoke and run another nut on top of the yoke. The two end nuts will jam when tightened against the two sides of the yoke. This gets the light an inch away from the clamp and makes it easy to slightly looses the nuts on each side of the yoke for focusing. I have to ask - Is this how the grid is supported? Because that is very disconcerting. ... Pandora’s Box, tho. If it’s unsafe for audience or staff to be under that grid at any time, you gotta voice your doubt. Maybe it was strong enough decades ago, but has weakened from overloading. Better a kerfuffle to replace it than innocent blood on your conscience and a lawsuit that wipes out the theater company. This is an official post. This has been posted on behalf of the forum administration. Slipping on my official Controlbooth.com Hat. This is an extremely dangerous situation. CB always stands behind the idea of if you can't do it safely, don't do it. Almost safe enough is not safe. You might get lucky, but you might not. We've all been tempted and most of us have made bad choices and gotten away with them. But sometimes you don't get lucky and people get badly injured. It's not worth it. I'm stunned at how many things were done wrong in that picture of your "grid". Yes, it is all expensive to replace. But not nearly as costly as a critical injury, fire, or death. All of which are highly possible with that shady setup. My test for things like this is always, "Would I allow my child to stand on that stage?" In your case the answer is NO WAY! A wooden "grid" suspended by swing set chain and open hooks is not safe by any definition. No debate. It's dangerous. The only safe answer to your questions is shut it down and replace it with Schedule 40 steel and properly rated hardware. It may not happen tomorrow, but your "grid" WILL fail and someone WILL get hurt when it does. Yeah, I know it's expensive and you are a small theater. However, that is not an acceptable excuse to keep endangering people. Knowing a situation is dangerous and choosing to continue risking the lives of people is called criminal negligence. Knowing a situation is dangerous and continuing to risk the safety of your friends... there are no words for that. "We do what we have to do to make things work". I appreciate your dedication to the show, but right now, what you "have to do" is not make things work. What you have to do is make things safe. I want to conclude by saying I get it. I know you will be mad at me for this post, and I get it. I've been there. I've done dangerous things and gambled the lives of actors, technicians, audience members, other people's children, on things that were "probably good enough". I "had to" because I didn't have the money or time to do it the right way. The show had to happen and I needed the effect to look cool regardless of the danger. I get it, I've been where you are and looking back, I got very lucky. Somewhere along the way I realized that I was the problem. My desire for the cool effect was dangerous to everyone else. I needed to have standards that I don't cross. I needed to be willing to say, "If the show must go on, then it's going to happen without me. I'm not risking hurting anyone!" I've found people respect me for that stand. In fact, my career has only gotten bigger and better the more I was willing to say "No". It's not going to be easy, but you can fix this and I have no doubt that when others know how dangerous things are, they will help you find a way to pay for it. MarshallPope, josh88, Dionysus and 9 others like this. Gafftaper is correct. This “grid” is like a burning fuse: eventually- and you can’t even begin to guess when in this case- it’s going to fail and cause injury or death. If you think it’s expensive to build a proper grid, wait until you see the bill for the fines, clean-up, repairs AND the rebuild. Why put a hospital stay or a trip to the morgue on someone you probably know? Shut it down, and shut it down now. You’re using swing set chain, and that is the deepest level of unsafe I’ve seen in a long time. MarshallPope, thatactorguy, dvsDave and 2 others like this. Probably in the $15,000-20,000 range if you simply contract for it. I Weiss claims to have lately provided pipe grid "packages" with engineering for installation by others - I don't know what that would save but some for sure. And I have a storefront theatre director/builder doing one themselves. I've been "coaching" on details- but he comes from a family of people in construction. When I suggested cutting slab and stepping seating down rather than platform up to maximize height over stage in existing building, he didn't hesitate to start sawing the concrete. Do you need a full grid? Could you live with 5 x 5 or 6 x 6 ? One-way battens? Do you have the structure to really support it? All questions without eyes on that I can't answer. thatactorguy and Amiers like this. First off find a REAL rigger (preferably ETCP certified but at least someone with a lot of experience who knows the math cold) to come and take a look at things. I see you are in a small town but you have a university there. Do they have a good rigger in the theater department? Can you buy the rigger dinner, a drink, and a few comps so the kids can see the show? The rigger will be able to give you a good safe advice on what you need to do this correctly. You then need to consult a structural engineer to tell you if the building can safely handle the weight you are going to put on it (how's the engineering program at the university? Does anyone there enjoy comp tickets to theater?). Bill said $15k-$20k... that's very possible. But you might also get lucky and the building can easily support the weight, you may have easy access to some decent structure to hang stuff from, and it's a small town so if you can get some help from the rigger, engineer and some volunteers you might be able to get it down to a lot less money. Under perfect conditions you can buy and safely hang a single 20' schedule 40 batten for around $500. Electricity is a whole other problem. Do you have a friend who is a licensed electrician or are you using orange extension cords that may catch fire at any time? There are a LOT of variables... Go find a rigger to get you started. RonHebbard and thatactorguy like this. 500 or so fet of pipe at 20/$500 per Gafftaper is $12,500 so close. I mentioned I Wiess because of the planning support that comes with buying materials from them. 1.5" Sched 40 Black Steel Pipe is $25 per foot!?! I mean, even with tariffs that seems ridiculously high. Granted, I haven't bought any in thirty years, but still? I'm guessing you must have a magic formula that includes the cost of connecting and hanging hardware? I'll pass that on to the powers that be. Right after sending my reply to you earlier today (was near the end of my lunch break on the route), I texted the Executive Director and said we needed to replace the grid, it's gotten weak and dangerous from use, we use real stage lighting fixtures now, etc. Got a reply that the board has just started discussion on things that need to get done to the building. I replied that the grid needs to go to the top of the list for safety reasons. I'll get in touch with the university and see what I can find out! We do run the occasional extension cord (using the shortest ones possible), but ONLY when we've run out of pigtails. I've been replacing the pigtails as they wear out with new ones, minimum 14 ga, but go with 12. Most of those are 15" or 36". Thats with engineereing, shipping, pipe, powder coat, hangers, clamps, labor, warranty, etc. All i did was use gafftapers price of $500 for a 20' batten hung. Ask him why his dead hung batten is $25/ft. I simple estimated the 30 x 45 as $15,000-20,000 based on experience. Actually I miss-calculated - its more like 750' not 500 so our estimates are very close. $18,750.